achat parfait: respect du délai, produit très bien emballé et en parfait état de fonctionnement. Très bon fournisseur. Delivery completed as promised and battery fitted without problem. 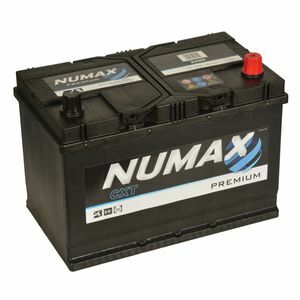 However, it would have been useful to have received advice that the battery would not be fully charged prior to delivery! Battery not delvered on day promided and was left in localgarage next day four miles away. Garage sells batteries so very awkward and embarrassing. Excellent service, arrived next morning, good price, fitted & worked perfectly. thankyou. Arrived next day, first class service. Excellent service including rerouting battery to another address - thankyou. Good delivery time. Fitted fine. Fully charged. Works well. The battery arrived very quickly. I've already emailed to say how pleased I am with your very efficient service. I'll say it again - SUPERB. It was a difficult battery to get hold of. I'll certainly ask for quotes for my other vehicles. In spite of me getting the poles the wrong way round (my fault) the battery still fitted and has been fine since with no problems. Fast delivery. quick delivery and an excellent fit, has given us no problems at all. Extremely good value but could do with a higher Amp Hr rating in my opinion , possibly 90 or higher. Will be a return customer ! Cheapest price I could find, delivery as promised - courier followed request to leave it in bin. Only slight criticism is that, when I rang to query about the fittings, I didn't feel terribly reassured by the person I spoke with and though about cancelling my order - gald I didn't now.